On December 11, 2008 I flew out of Whitehorse and started my second (annual?) pilgrimage to Texas. I had been looking forward to visiting with Elizabeth and the others, as well as their families, and making other contacts in the State while I was there. Maintaining contact with the four women is important for a number of reasons. For Elizabeth, with another 25 years on her sentence, losing herself in the Texas prison system and her connections with the "free world" is a very real threat with disastrous consequences. Because of the distance I travel I am able to get a "special visit" consisting of two four-hour sessions on Saturday and Sunday. Normally visits are for two hours once per weekend. Since I am a non-family member visits are made with a sheet of plate glass between us talking through a telephone receiver. Having this face-to-face communication is important. Virtually all of my contact with the four women has been through letters sent in the mail. Because of the distance between Marlin, Texas and Whitehorse, Yukon that entails up to 3 weeks for a set of letters, and any questions and answers, to be exchanged. Clarity of communication becomes paramount in that situation. After the patience required of snail mail, instant communication feels like a luxury almost too good to be true. Inmate telephones are scheduled to be installed in Texas prisons in 2009, but there are questions whether or not they will be able to call into Canada. This year I only got to visit with Elizabeth and Kristie. Texas inmates are only allowed to make a change to their visitor's list every six months. Unfortunately Cassie had just made a change to her list back in September when I first informed her I was coming. I went to Mountain View on Saturday morning on the chance they might let me in anyways. To his credit the officer at the gate did his job, stuck to the rules, and refused the visit. Anna and Elizabeth are both at the Hobby Unit near Marlin, Texas. For some reason I was under the impression that it was against the rules to visit two people on the same Unit. Because of that I didn't send Anna my information so she could put me on her list. I was later informed that it is permissible to visit two people on the same Unit, but it was too late to get me on the list. Felt bad about that because I really would have liked to have met Anna, and Cassie as well. It was poor planning on my part and next year I will have this all sorted out. It has been almost 3 years since Elizabeth and I started exchanging letters. Finding her letter in my mailbox every Tuesday or Wednesday night when I get home from work has become an important part of my life. Through those letters we have developed an incredible ease and depth of communication. The strange thing that happened is that on the first day of the visit there was this sense of disconnect, and I found my self trying to reconcile that the person in front of me was the same person behind the words on those pieces of paper in my mailbox. I was frustrated and found the conversation remaining more superficial than I had imagined or wanted. On Saturday night I was able to work that through in my mind, and on Sunday we had a much more substantive chat. How 4 hours could possibly go by so quickly I will never know. The good news I was able to give to the women was the the National Center for Reason and Justice (NCRJ) Board of Directors had voted unanimously on their innocence and a commitment to sponsor their case. We had submitted an application back for sponsorship in August and they spent almost four months vetting the information we supplied them. Having NCRJ onside is a definite step forward for the case, and will hopefully open some doors for them in their pursuit of truth and justice. This was very important because there had been no forward momentum for nearly a decade. Psychologically this will give everyone hope and something to believe in once again. 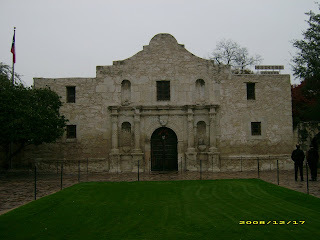 Spent my last three days in San Antonio and did the tourist thing visiting the Alamo and downtown San Antonio. Maria Vasquez, Anna's mother, very kindly put me up at the La Quinta hotel in the center of downtown SA. 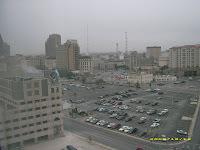 From my 14th floor room I had a great view of downtown San Antonio. On my last day in SA Mrs. Vasquez took me and Anna's friend, Melody, out to dinner at an old Mexican restaurant. It was great food and a really Mariachi band that walked around playing. A side benefit of my advocacy is that I have been able to explore and discover Tex-Mex or Tejano culture. It is all very new and interesting to me. It was sad to get on the plane to come home on Thursday morning but I was glad to have made the trip. It definitely renews my commitment to the case. My plane was held up on the tarmac in SA and I missed my connection in Phoenix. I got rerouted on a flight to Salt Lake City full of overly-polite Mormons, and finally got into Vancouver at 11 p.m. I had missed the last flight to Whitehorse so I had to overnight and get the first flight out Friday morning. I grabbed a cab downtown and was able to get a hotel and catch the last set at the Yale. Ironically it was a Stevie Ray Vaughan cover band called "Texas Flood". I don't get to see a lot of live music living up here, so maybe it wasn't such a bad day after all. The controversial term "harmless error" is often used by Texas appellate judges in their opinion response to criminal trial appeals. In Elizabeth Ramirez' appeal to the COURT OF APPEALS OF TEXAS, FOURTH DISTRICT, SAN ANTONIO Justice Alma L. Lopez describes comments made by prosecutor Phillip A. Kazen during his cross-examination of Elizabeth as "harmless error". In her fourth issue, Ramirez argues that the trial court erred by failing to grant a mistrial because of an improper comment by the prosecutor. Ramirez is referring to a remark that the prosecutor made in response [*7] to her testimony denying culpability. After Ramirez testified that she loved V.L. and that she would not hurt V.L in any way, the prosecutor remarked: "So says O.J., Ma'am." Ramirez's attorney then asked for a mistrial and the trial court denied the request. In front of the jury, Kazen made a comment that made a direct comparison between Elizabeth's relationship with V.L. and that of O.J. Simpson with his murdered ex-wife Nicole Brown Simpson. Later in the appeal response, Lopez describes the evidence against Elizabeth as being "overwhelming". This statement directly contradicts Prosecutor Kazen who tells the court that the crux of the evidence presented at trial consists of Elizabeth's word against her niece, V.L. There was no physical evidence or corroborating adult witness to the girls claim, only her statement and testimony. Elizabeth's trial took place in February 1997, less than two years after O.J. Simpson's highly publicized murder trial and subsequent acquittal. The stark and powerful image of Nicole Brown Simpson's body lying on her doorstep with her throat slashed, spattered with blood, contrasted with her former husband's smug, self-assured attitude at a trial where he was defended by the best lawyers in America. These images had been repeatedly broadcast in both print and television media shortly before Elizabeth's trial. Those images had, and continue to have, a profound emotional effect on the general public. The belief that O.J. Simpson "got away with murder" was widespread. For appeals justice Lopez to call Prosecutor Kazen's direct comparison of Elizabeth Ramirez with O.J. Simpson "harmless error" is colossal error. That Kazen's statement was, in fact error at all, is questionable. The magnitude of the visceral response that comparison and its associated images elicited in the general public, and therefore the jury, would have been tremendous. Taking into account Elizabeth's only defense was the credibility of her testimony before the jury, this statement becomes more than enough to inflame their minds, and grossly prejudice the verdict. In Elizabeth's cross-examination, Kazen's primary goal was to destroy her credibility. It seems unlikely he made this statement in error. Considering how quickly he responded to Elizabeth's claim that she loved V.L., it is seems more likely to have been premeditated and intentional. A more likely scenario is that Kazen had been waiting for Elizabeth to express her feelings for V.L., and had preplanned his response. That statement in caused tremendous harm, and appears unlikely to have been made in error.